We've had a whirlwind of things happen over here the last few months with Em. 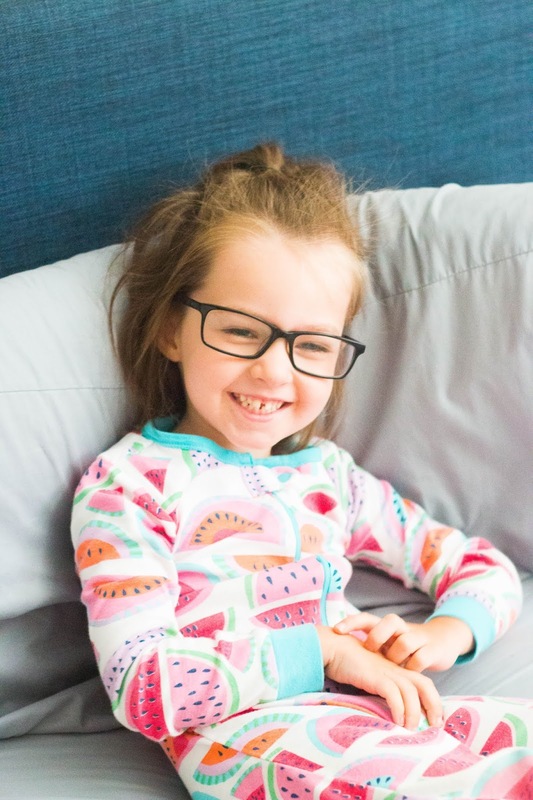 The last time I shared an update on her, we were waiting to find out whether or not she would need an operation to correct her hip dysplasia, and she had recently been diagnosed with sensory processing disorder. The sensory processing thing was a hard situation because according to the therapists at Shriner's her sensory processing needs were getting in the way of physical therapy, and so they essentially kicked her out of PT until we got the sensory processing things under control with Occupational Therapy (OT). We saw the OT one time for the initial evaluation, and then were put on a huge waitlist before we could come back for an actual appointment. We booked two appointments for June and July, but the initial appointment was when I was away at girl's camp, and then they somehow lost our other appointment, which meant she couldn't be seen by an OT again until the end of July. I was beyond frustrated because this meant that she wasn't receiving PT this entire time as well. As it turns out, we've done a huge screen time detox (mostly unintentionally) throughout the summer, and it turns out that all the raging tantrums and problems that we were experiencing with Em and sensory processing disorder are nonexistent. We're fairly confident in saying that she actually had a huge screen time addiction, and once that was detoxed from her, it made 90% of the issues we were dealing with go away. She still has a few problems like not liking to be thrown around upside down, and has some issues with feeling off balance against gravity, but for the most part, the whole OT issue resolved itself and we're no longer worrying about sending her to OT since those are services that she'll continue to get once school starts again, and it's no longer a pressing issue. When we were kicked out of therapy, I reached out to one of my friends who also has a daughter with holoprosencephaly, and also used to live in Utah. I knew she had a therapist that she loved that used to come to her house, and I asked her about that, and now her old therapist who used to work with her daughter (and taught her to walk!) is now working with Em! He's been to our house 4-5 times now, and in that time Em has fully crawled up the stairs, and can pull to stand and cruise on furniture! Our big goal right now is to get her to pull to stand, and then walk independently with her gait trainer this school year. She's made so much progress in such a short amount of time that I'm starting to think this goal isn't too lofty. Also bonus points, we do have to pay for this PT to come to our house (versus free at Shriner's), but he's only $100 so it's a steal compared to other services. Also, our new therapist was a mentor for the therapist who kicked us out of Shriner's which is a hilarious fun fact. He said he has no idea why anyone would kick Em out, and the way he goes off about that situation is hilarious. I just can't sometimes. On Monday this week we went back into Shriner's to get Em's hips x-rayed and to see where we stood with the entire hip dysplasia situation. She did her x-rays like a champ and didn't cry for most of the visit! Such a huge improvement! The images came back saying that her hip had actually improved since the last time we were there, and that she was no longer a candidate for the reconstructive hip dysplasia surgery! Best news ever. Since the botox injections worked well the first time, we decided to do them again, and we'll keep doing them every three months until they're no longer effective. And that is the kicker. Botox will work well to keep the muscular strain off her hips for a little while, but we likely will get to the point in the next year or two where the botox will no longer be effective, and then we'll have to take more invasive measures. We're thinking that in the next year or so we may need to do a "soft tissue release" surgery, which means that they would essentially go in and make micro-tears along her hamstrings and abductor muscles, and these tears will essentially lengthen the muscle, make it looser, and then again, release that pressure on her hip. This is much less invasive than the first surgery we were thinking of, and we're much more willing to be okay with this surgery than we were with the alternative full body cast for three months option. This new surgery will have fairly minimal recovery should we need it. And that right there is the huge update on Em for right now. It's hard to believe in one month this girl will be four-years-old. It feels like this time has gone by so fast, and so slow all at the same time. Once we knew that Em was here to stay after she was born, I was worried about what the future will hold, and although it's definitely brought trials and difficulties, being this girl's momma will always and forever be one of my greatest joys. How did you wean off the screentime? My son is almost 3 and I feel like he is addicted to the screen and I'd like to wean him off of it and maybe only use it for super special treats, but I also have a 10 month old and use that screen time to be with my other son and do other things I need to do. Just curious as to how that all worked for you and what she does now instead of watching for time that you need to do things if that makes sense? So glad too that you guys are doing well! I'm a new reader so I'm catching up a bit. Thanks for commenting! The biggest thing was just not being in school for us. Emm would watch a show while she ate breakfast before preschool, and then watch another show while eating lunch after preschool, and then she would want the phone throughout the day and it just turned into her using it for HOURS at a time. It was definitely an extreme. Now that we're home for the summer and aren't running back and forth to the school all day, we wake up around 9, and Em and Jay eat breakfast at the coffee table together, and then after that she gets changed and cleaned for the day, and then by that time it's 10:30-11ish, and then we're off to the pool for swim lessons, and then we get home and eat lunch at the coffee table, and then after lunch, neighbor kids are usually running through the house and playing which means no screens, and then once the neighbor kids are gone it's usually dinner time and my husband comes home, and then he usually plays with the kids or watches a movie with them while I'm running or getting my workout in for the day. So we went from using screens probably upwards of 5-6 hours a day, to maybe 1-2. And filling the days with more play and less screens has really helped sleep and so many other issues in our home! As far as getting things done, my kids are HUGE independent players which is really helpful. So while they play, I can get work done on the blog or clean and it usually goes well!